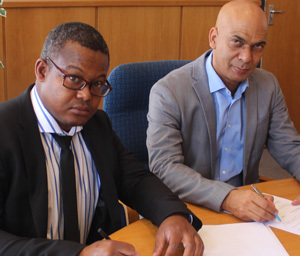 National rail operator, TransNamib and Ascon Energy (Pty) Ltd signed a Rail Transport Agreement mid March, for the transportation of coal, containers and various commodities between Walvis Bay and the inland terminals of Grootfontein and Gobabis. The two companies formalized their business cooperation by signing a firm and binding agreement, which was signed by our CEO, Johny Smith and Nate MacMillan, Ascon Energy’s Managing Director. The signed agreement will cater for the transportation of more than 600,000 tons per annum of various commodities, other bulk commodities as well as containers. The initial focus will be the imports and exports on the Walvis Bay to Grootfontein route; followed by the Gobabis to Walvis Bay route, utilizing the Trans Kalahari Corridor. Ascon Energy, a subsidiary of the Ascon Group, of which the latter is an international oil and commodities trading organization that has been serving the global physical markets for more than three decades, always paying due attention to the needs of their clients. Their key focus areas are Eastern Europe, West- & Southern Africa, the Middle East as well as the Asian outlets. They are particularly concentrating on niche markets where they operate and cooperate with local companies. Ascon’s typical day to day operations entail the structuring and execution of various oil and commodity trade related transactions whilst their core business is the refined derivative product and coal trading. Since inception in 1984 they have been expanding and diversifying their business in a balanced manner, from their roots in crude oil and refined product trading in Eastern Europe and the Middle East to Asia and Africa.